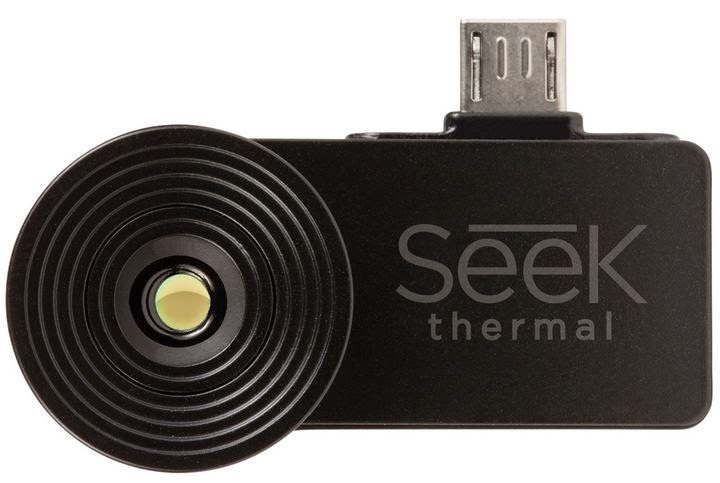 "Seek's breakthrough technology lets people see heat for the first time, something that only government agencies and companies could afford in the past," said Seek Thermal CEO, Robert Acker. "The Seek camera not only gives average consumers the capabilities in home improvement and safety and security that only professionals used to have, but we are also especially excited about the hundreds of new use cases for thermal that our camera will enable." Thanks to JZ for letting me know! Another FLIR One alternative, Hema-Imager Kickstarter project, fell short from its $205,000 fundraising goal recently. HemaImaging product was supposed to use German Heimann Sensors Gmbh thermopile array. Nice! but this product shall involve loads of patent licensing (shutterless NUC patents, flirone application patents etc). just curious how they still can manage to market it with a price tag less than $200 while achieving 6 times more resolution than flirone which is selling for over $300. any thoughts may help. 1. FlirOne has a manual shutter. This one seems to be a shutterless device (Can anybody vouch for it?). So, guessing minimal IP issues. 2. FlirOne has cost burden of battery and associated electronics + shutter and electronics. The sensor of this $199 device is using thermopile technology so no NUC / shutter required? Where is the FAQ page? Some history here, I have first hand knowledge of this situation in background as an analyst; In 2004, FLIR purchased Indigo for approximately $185 million, acquiring Indigo's (prior company to Seek) patents, technology, and intellectual property. Bill Parish and Fitzgibbons (Seek founders) were shareholders and officers of Indigo before the company was sold. After the sale, Parish and Fitzgibbons continued working at Indigo. Both informed FLIR that they intended to create a new class of product for consumer markets and company called Thermicon and asked FLIR's board if they wanted in. Ratheon lined up as a licensing customer. FLIR backed out and so did Ratheon when they found out FLIR had backed out. Then FLIR sued for a perminent injunction against Parish and Fitzgibbons for (1) making use of appellants' trade secrets in the design, manufacture, and high-volume production of uncooled Vanadium Oxide microbolometers; (2) selling uncooled Vanadium Oxide microbolometers in commercial markets less than 12 months after respondents entered into a license with Raytheon Company or any other third party to purchase intellectual property; or (3) using, disclosing or misappropriating the contents of an Indigo commodity code database that Parrish attempted to download while an employee at Indigo. The trial court found no misappropriation or threatened misappropriation of trade secrets and FLIR was forced to pay >$1.6M in court costs and attorney's fees. It is my belief that Parrish has successfully proven that he has access to the IP and patents through an agreement, only after a given amount of time, or Parrish owns the IP and is licensing it back to FLIR, which would account for the dispairity in cost of the two products. -R. T.
May be it is similar to the lawsuit that the company who hired Shuji Nakamura to invent the blue LED and turns out this blue LED patent is not fully owned by that company who paid for the equipment and salary. This year Nakamura won the Nobel price in Physics and who know about the company which called Nichia Corp. that started it all. Any idea why SEEK didn't implement any fusion of visual light image and thermal image to further enhance the image quality like what flir 1 did? Patent issue? Its hard to digest that Flir would license anything from anybody. I still don't get the huge disparity in prices. The difference in price is not likely to be related to licenses. FLIR runs a very profitable business with many product lines that stand a risk of cannibalization from these products. Seek is a venture backed company (likely well funded) that has no existing products to risk and for whom it probably also matters less if they ever get the money back from this very product itself (in fact, they most likely never will). What they absolutely have to do is to start creating a new market from zero, make a splash in the media and start building market share and company brand. If they succeed, and become a key player in a market that eventually turns out large scale commercial, the company venture capital owners get their money back selling the company (again). But the profits of this very products matters less, only growth does. This is my guess as to what explains the price difference - FLIR wants to somehow earn money, SEEK wants to build market share. This is quite an interesting story from an engineering, startup, business and litigation perspective, which is why I feel I could elaborate some more on the background given above. Note I’m not a laywer and has only followed this from the sidelines. Parish is certainly one of the big pioneers in the infrared area and in many ways the definition of “the American entrepreneur” – not only in the engineering sense but also from a business development perspective. He founded Amber electronics in 1981, to commercialize infrared systems and sensors, being one of the first companies to focus on the commercial side. The company was sold in 1992 and later became part of Raytheon Vision Systems. In the late 1990, Parrish started a new company – Indigo systems. As a curious fact they were said to move into the same building they had used while being Amber – which happened to be suitable for infrared sensor manufacturing. The business model was quite similar to Amber, with a focus on commercializing infrared technology. A big development was a big cost reduction in the production of uncooled microbolometers, eliminating the use of a TE-cooler for stabilization of the sensor temperature and a high volume vacuum sealing process. This company was sold to FLIR systems in 2004 for $185 million. The reason for this purchase was that FLIR wanted access to their own infrared bolometer production and the related patents, as part of a “vertical integration”. Parrish was legally bound to stay with FLIR for about two years. When the two years were coming to an end, Parrish approached FLIR management and Raytheon with a business plan to create a company that commercialized infrared bolometer sensors for the commercial markets (sounds familiar?). This is about the time when it all turned into a game for lawyers. Raytheon sued Indigo for allegedly stealing trade secrets and infringing patents when former Amber employees joined Indigo systems. Of course Indigo was now owned by FLIR systems to it was FLIR that was targeted by this lawsuit. FLIR systems, on the other hand – sued Parrish for similar claims (although Parrish at the time only had a business plan that he approached FLIR and Raytheon with). FLIR claimed the business plan would need to use FLIR IP (i.e. the IP hey bought when Indigo was acquired) and that the plan was conceived while he was a FLIR employee. Parrish claimed this was a business plan he had come up with before Indigo was acquired by FLIR. The courts later ruled that FLIR did not have any basis for this lawsuit under California laws, and that the intent was clearly to stall Parrish business plan, knowing that they would not actually win. By the look of things, this actually succeeded - but not without cost, as FLIR was countersued by Parrish for the damage caused by the lawsuit, and finally FLIR settled to pay Parrish $39 mUSD to drop the lawsuit and settle patent disputes. The lawsuits between Raytheon and FLIR were eventually also settled. From FLIR’s perspective it most likely looked like Parrish tried to sell the same company twice (actually the third time) when he approached FLIR with the business plan. From Parrish perspective, he had all the rights to do so and by the result of the lawsuits the courts seem to agree. Happiest of all are likely all the lawyers that got to benefit from all the lawsuits. No need to feel too sorry for Parrish (given what he earnt from selling his company), FLIR (for which the Indigo acquisition has been extremely profitable) or FLIR management (who collected >$10mUSD per year during this period in bonuses and salary).